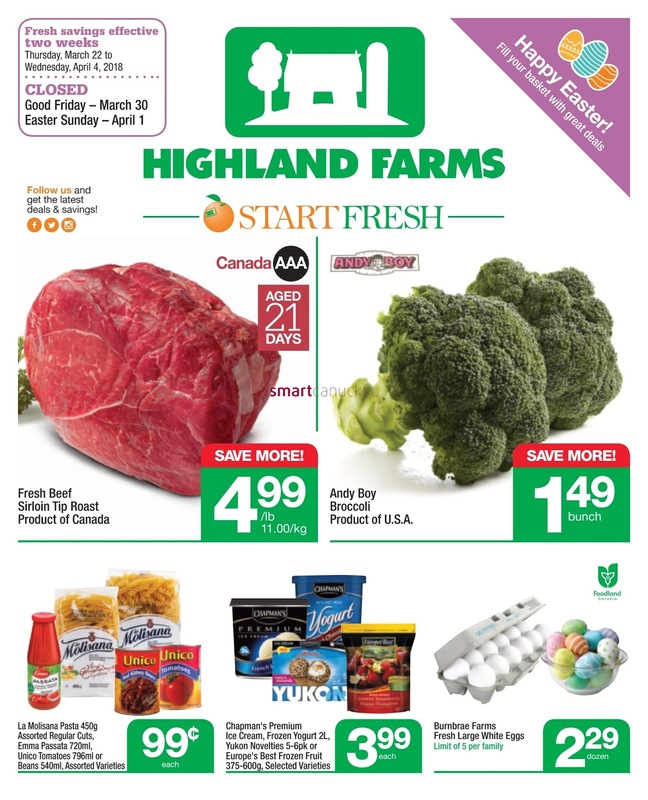 Highland Farms Canada Flyer March 22 – April 4, 2018 - Fresh Beef Sirloin Tip Roast $4.49/lb Sale Price Product of Canada. $11.00/kg. Aged 21 days. Burnbrae Farms Fresh Large White Eggs $2.29/Dozen Sale Price Limit of 5 per family. 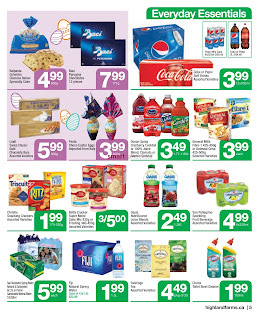 Chapman's Premium Ice Cream, Frozen Yogurt, Yukon Novelties Or Europe's Best Frozen Fruit Chapman's premium ice cream. 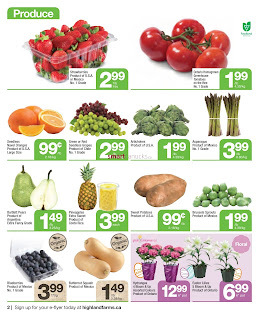 Frozen yogurt 2 L.
La Molisana Pasta, Emma Passata, Unico Tomatoes Or Beans $0.99 Sale Price La molisana pasta 450 g. Assorted regular cuts. Emma passata 720 ml. Unico tomatoes 796 ml. Beans 540 ml. Assorted varieties. Hydrangea 4 Bloom & Up $12.99 Sale Price Assorted Colours. Product of Ontario. 6" pot. Blueberries $3.99/170 g Sale Price Product of Mexico No. 1 grade. Strawberries $2.99/lb Sale Price Product of U.S.A. or Mexico no. 1 grade. Tray. 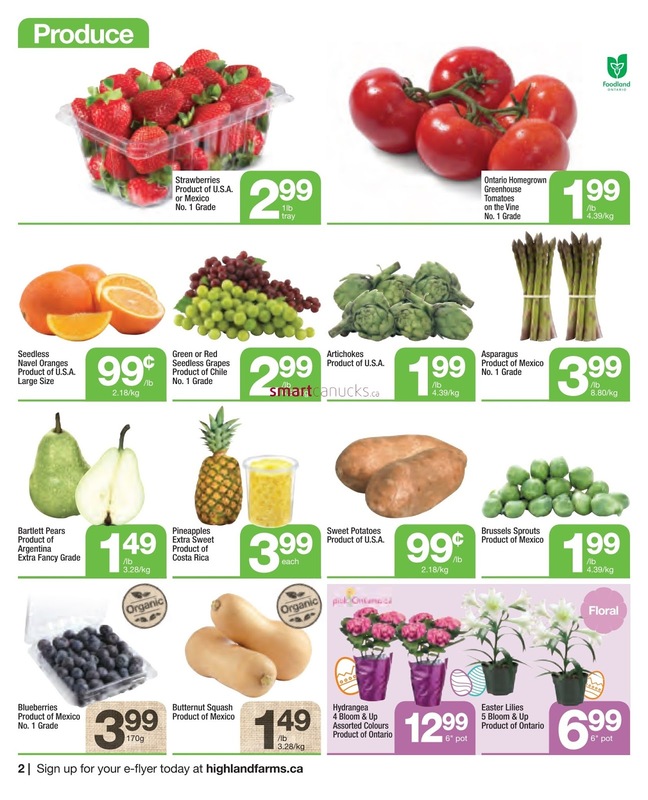 Ontario Homegrown Greenhouse Tomatoes $1.99/lb Sale Price $4.39/kg. The Vine No. 1 grade. Green or Red Seedless Grapes $2.99/lb Sale Price $6.59/kg. Product of Chile No. 1 Grade. 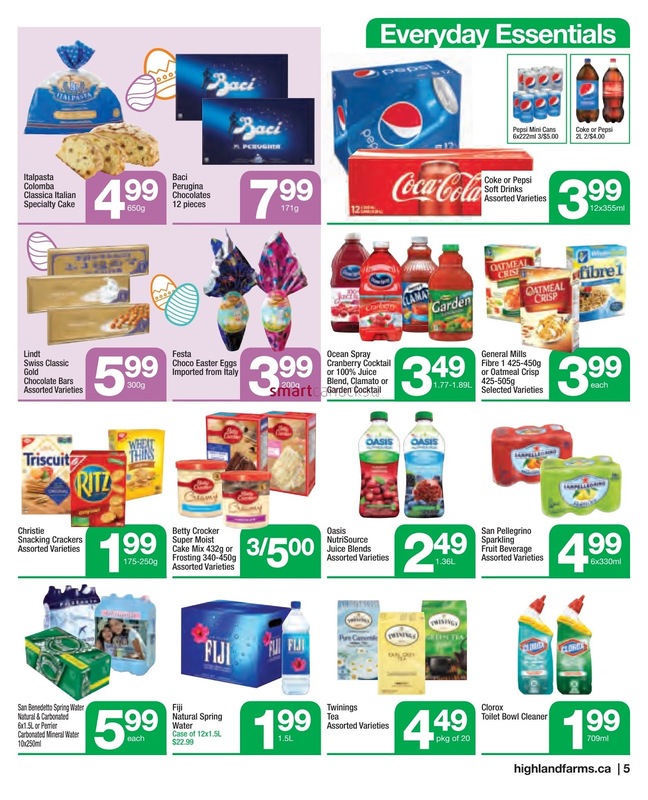 Wonder Classic, +Fibre, Texas Or Thin Sandwich Sliced Bread White Or 100% Whole Wheat $2.29/675 g Sale Price. 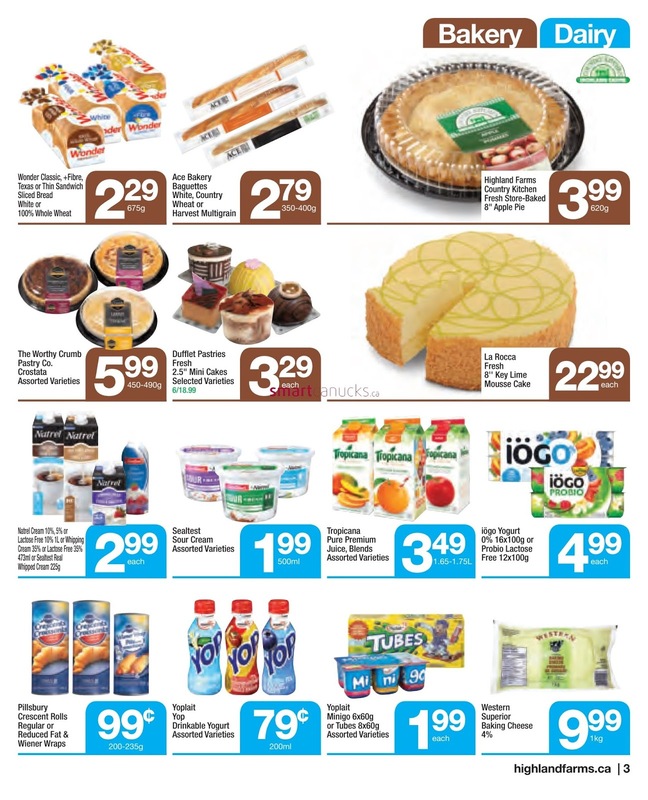 Natrel Cream 10%, 5% Or Lactose Free 10% Or Whipping Cream 35% Or Lactose Free 35% Or Sealtest Real Whipped Cream $2.99 Sale Price Natrel cream 10%, 5% or lactose free 10% 1L. Whipping cream 35% or lactose free 35% 473ml. Sealtest real whipped cream 225g. 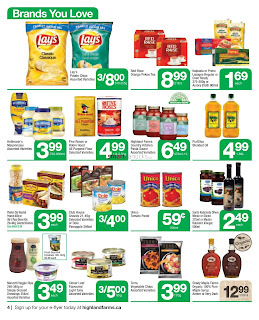 Tropicana Pure Premium Juice, Blends $3.49 Sale Price 1.65-1.75 L. Assorted varieties. 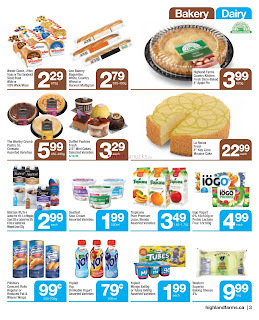 Iogo Yogurt 0% Or Probio Lactose Free $4.99 Sale Price Iogo yogurt 0% 16x100 g or probio lactose free 12x100 g. Pillsbury Crescent Rolls Regular Or Reduced Fat & Wiener Wraps $0.99 Sale Price 200-235 g. Yoplait Minigo Or Tubes $1.99 Sale Price Yoplait minigo 6x60 g or tubes 8x60 g. Assorted varieties. 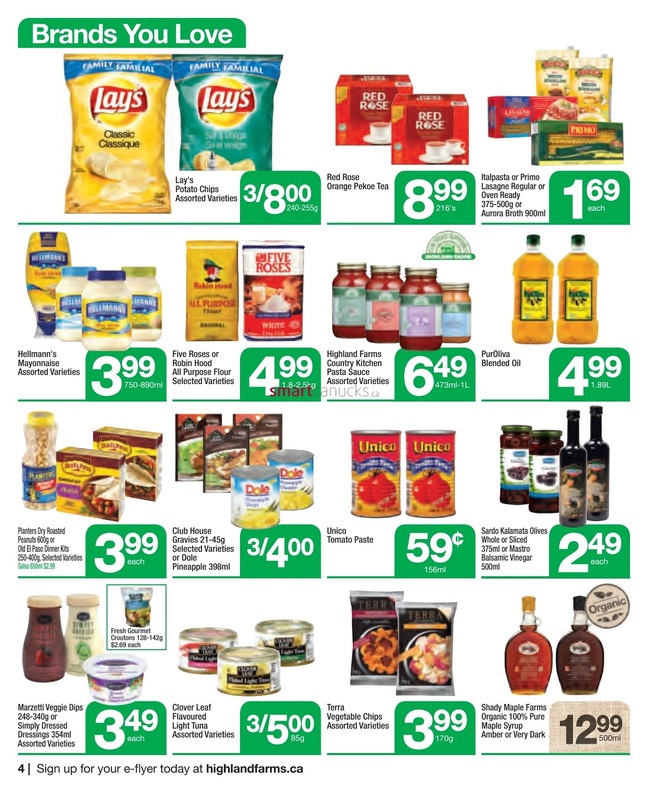 Marzetti Veggie Dips or Simply Dressed Dressings $3.49 Sale Price Assorted varieties. Marzetti veggie dips 248-340 g. Simply dressed dressings 354 ml . Italpasta or Primo Lasagne Regular or Oven Ready or Aurora Broth $1.69 Sale Price Italpasta or primo lasagne regular or oven ready 375-500 g. Aurora broth 900 ml.